Through superior flexibility and excellent quality, WordPress shed the label of mere “blogging” software long ago. It’s become an indispensible content publishing platform for millions of real businesses and talented writers and thinkers across the web. Chances are, it’s even powering your website, which makes the infographic you’ll find below indispensible. If you’re running your site on WordPress there’s a chance you’re running into certain errors that can make you look, well, just a little bit silly. The good news? These errors are an easy fix. Is your site loading slowly? That’s a huge no-no in the era of Google placing emphasis on page speed. See #1. Did your site get de-indexed? Might be because of silly error #5. How about you woke up one morning with your sidebar living below all your content? Check #10 for a quick fix. Thanks for this! I have been using WordPress for a while but have only recently begun to understand the full capabilities of it. This is a great list of things that you may not notice but could really affect people’s views and experience of your site. Thanks Lizzie! WordPress is great because there are always new frontiers to explore, new capabilities to leverage. You just don’t want to overlook these simple errors that can make you look, well, silly! I´m sure if you ask your trusted developer he/she knows what to do to make you not look silly. Michael, I agree! I’d sure hope so. And Geoffrey, you may have just hit on a perfect follow-up piece to this one. Georffrey, even just a quick search of each of those issues on Google will return a wealth of information on how to fix them yourself, as you don’t have to be a developer to take care of most of them. You just need to know where to go. In fact you’ll probably find most of those fixes all in one place in an article by a trustworthy WordPress blogger. @Jerod, great infographic; loved the humour and clean design mate! Thanks Brendon! All credit for the design goes to the great Rafal Tomal. He is the man! Agreed! Not all of us are experienced in WordPress. Too much knowledge is assumed. Mine isn’t even live yet only because I don’t know how to bring it live. The directions I was following assumed knowledge I just didn’t have. Once I’ve learned everything I need, I’m going to put out an ebook with complete directions on building a WordPress site — step by step, from start to finish, assuming no knowledge at all. I have a strong feeling it will do very well. Keeping the default WordPress blogroll is another one of those classics. Hey nice info-graphic, i believe i am following every advice from this blog for my blog. Nothing looks as silly as a typo in an infographic telling users about all the ways they might be silly. Oops. Is there a typo? I just double-checked and didn’t see one. So now I’m going to feel REALLY silly if you point one out. Thanks! I did not know that my deactivated plug-ins could cause a problem! Just deleted them all. Grateful to find this information. What a surprise, and how silly I am looking. My old blog on the same subject (but self-hosted wp) at least got 20-100 visitors a day. This one has 0-29 (a one day spike). I feel invisible – which is worse than silly. I have good keywords, links, what could be wrong? The answer: I had a whole bunch of posts on private and thanks to you, they are now to be scheduled forever into the future. Not only the content but even the design of the infograhic’s superb..
Great points and all very valid…but a little bit useless for DIYers without the fixes. Becoming aware of a problem is the first step. Then you can simply Google the solution. Agreed. That is one of the greatest aspects of WordPress: how easy it is to simply Google an issue and fix it. When I first started with WordPress, knowing absolutely nothing about it or HTML, I would simply do a Google search for whatever question I’d have asked a developer if one had been sitting next to me. More often than not I found an easy answer or even a tutorial that showed me what I needed to know. I’m so new to this whole wp-blogging world so every piece of advice is golden. Good information, though I don’t agree that these things make the web log owner look “silly.” As a web log reader, I don’t necessarily look down my nose at a web logger just because random errors show up in their web logs from time to time. I just chalk them up to errors and move on. Quinn, that’s just silly. If someone is, for example, using an old version of WordPress, you should look down your nose at them! Just playing. Obviously we were being a bit tongue-in-cheek with all the silly talk, in order to bang home the point of how easy it is to avoid these issues, but I certainly wouldn’t ever seriously advocate looking down your nose at anyone. These errors happen. And even though they are easy to fix, they can also be easy to overlook. That’s why we wanted to do this infographic, because chances are we’ve all made these errors at one point or another (possibly even right now! ), and the goal is to help everyone avoid them…and have a little fun while doing so. Good tips. 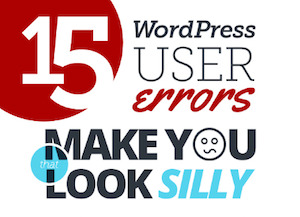 But I’m wondering (about #15), is it so terrible if people know which version of WordPress you’re running? As long as you make sure to update WordPress whenever a new version comes out you should be good, right? I think the real issue here Hannes is if you are NOT updating WordPress. Hackers may know of a specific vulnerability in and old version and look for sites running that version. If you don’t make it easy for them to find out, then you may get overlooked. If you are updating as soon as updates come out, then letting people know, as Copyblogger does, really isn’t a big deal. But not everyone does, and advertising that you’re on an old version is not good. Right. So it’s a combination of not updating WordPress and letting hackers know you haven’t updated in a while. I’m also wondering if it’s possible to completely remove all traces of version information. Even though Copyblogger has removed the “generator” meta tag (which would say “WordPress 3.4.2”) you can still find “?ver=3.4.2” a few times in the HTML source code. But perhaps the “generator” meta tag is what hackers are using to find vulnerable blogs (using bots)? @Hannes, there are security plugins that will remove the “?ver=3.4.2″ in the URL paths in your code. I am not sure if there are any free ones, but I am using a paid plugin (not expensive) called “WP Shielded” by KME Byrne and Atinder on some of my sites. It takes care of a number of security vulnerablities in one foul swoop. But there are many plugins that do a variety of these things, so just find a good one. Thanks Jerod for a brilliant infographic and thanks for the code to copy and paste this infographic into my website as a blog post. I’ve only posted info I’ve written myself so far, so this will make a nice change. An important piece of info re deleting the deactivated plugins – much appreciated. I’d like to add that keeping themes you’re not using installed is a sure-fire way to get hacked as well. Simply leaving these things on your server is a recipe for disaster. I mean, something as simple as a text file could be the open door a hacker needs. Unfortunately, I’ve had my sites hacked enough times to find this out first-hand. I don’t know about the rest of your readers, but when I start a new site I install a bunch of themes and try them on for size to find one I like. Great point Chris. Good rule of thumb is that any theme or plugin that is not a) in use and b) necessary really should be targeted for deletion. You’ll be safer because of it. Side note: its not at all what I expected. The term “user” in the title leads me to believe the list is of things beyond your control. (i.e people using your site) not misconfiguration. Ah, good point Edward. I can see how it could be read like that. “User” has many different meanings in relation to WordPress! I also had no idea about the deactivated plugins. Thank you! Another error that drives me nuts is approving comments that are obviously spam. But this error isn’t only limited to WordPress. Yep, agreed on the comment issue Tom. Nice post. I almost made it to the end without felling silly. But then I got to the readme.html file in the root of the website. Now I feel silly! Rick, if you fix it then you don’t have to feel silly! Nice infographic however the part about deactivated plugins does not seem to make sense. If there is a backdoor/liability in a plugin it will be there for the hacker to use whether it is active or deactivated. Deactivated plugins update the same as active ones so just been deactivated does nt mean a liability would not get patched. The point here is that if a plugin is deactivated, it most likely means it is not necessary…or that it is only used periodically as opposed to on a daily basis. If either is the case, why keep it on your site? Delete it until its needed. Elizabeth, will the readme file be added again when WordPress is updated to the newest version? I notice Copyblogger’s is 403 forbidden, not 404 not found. Thank for the tips. I didn’t knew the deactivated plug-ins where actually a potentional security risk. Deleted all deactivated plug-in, but there is 1 which I can’t delete. Will try to install it again and try to delete it afterwards. Interesting that you mention posts that span the entire page…there are “experts” out there in the affiliate marketing space that specifically recommend displaying the full post on the home page. Reason? Not everyone is going to burn the 1/3rd of a calorie to bother clicking on “read more” to get to the post, and they found that by displaying the full post on the home page it ends up increasing the reading rate and the click thru rate (for the affiliate links). So I think in certain contexts, the full post on home page can work — even though I agree it does look bad. Thoughts? If a user is so uninterested that they won’t click a “more” link to read a full article, they’ll rarely be interested enough to go on to buy a related product. I won’t say it never happens, I’d say test it for yourself and see what works. If it looks not-great but it works best, then I’m all for doing what works. But that kind of very simple “drive traffic to one blog post with an affiliate offer” model is hard to keep running in 2012, IME. Genuinely savvy affiliate marketers build loyal audiences and then make relevant offers, and a user-friendly, readable site tends to work better to build an audience. I have to agree. While using excerpts and the “Read More” facility are recommended – adding them to a list of things that make one look “silly” is quite narrow minded. It assumes that there is only one way of laying out content on a blog and that unless everyone adheres to this style, they will be foolish but last time I checked WordPress is about community, open-source, open-mindedness and creativity – not just another bandwagon (pun intended). It depends on what someone is trying to achieve with their blog which is what should determine how they should use this function. It also depends on the design of the blog and nature of the content. In lots of cases it is not wise to do it but the proclamation of labeling all who don’t use this function as “silly” is in itself quite silly. I’m going to sound a bit “me-too-ish” here, but I had no clue about the security risk posed by deactivated plugins! I’d been reading along feeling quite smug about my lack of “chair-to-floor interface” errors, and then y’all got me with that one. Thanks for great information. Again. I’m new to the idea of hackers exploiting backdoors caused by inactive plugins. How exactly do they do this? As Ric said, wouldn’t it be better to just grab plugins from reputable sources instead? Also, are these backdoors functioning the same way blog comment spammers find your particular blog? I always hear from people that the first time they saw the blank page (after making a php error) that it freaked them out. It really does look like they lost their entire site. The white screen of death is a horrible thing to have to deal with, I find it happens to me when i try and edit a file with code that I found on a site like WP Beginner! Funny you should mention the White Screen of Death, as the only site where I sometimes see it is when I call up the Google home page in the Safari browser. OK, this isn’t WordPress. However, it shows that even the likes of Google and Apple can look equally silly. – Not changing your permalink structure. No one’s going to remember p=15 as your “About Us” page. Plus it’s terrible for search engine optimization. Set your permalinks to %postname% or %cateogory%/%postname% – then sit back and soak in all that delicious search engine optimized goodness on every post. Sherice, this is a great one. Been guilty of it also with my first blog 🙂 It’s hard not to make any mistakes when you start blogging for the first time! Nice list of tips. However, I would hardly call a few of them “silly” mistakes. For example, the database connection error can happen at some point and you don’t necessarily have control over it. I haven’t noticed any blog with index.php in it’s url. how does this happens, and what are the ways to prevent this? Sadek, I’ve seen some. I believe it has to do with how permalinks are set in the Settings section of your WP dashboard. You want to have them set as Post name or a similar setting so you reap SEO benefits. Good one 🙂 Yeah, definitely… it looks a bit silly when you have the default WordPress favicon on your website. If I haven’t applied #9 to my website (“read more”), do I have to go back and insert the “read more” into each and every post? Or is there a way to apply it to the entire front page…or all my past posts? Elaine, it would depend on your WordPress theme. I have one that does it automatically and another one that I have to break posts manually. I’d check with the theme owner and they should be able to help you. Cleared up my inactive plug-ins right after I read this 🙂 Didn’t know that was a potential threat for hacking. Very helpful info here on wordpress for a novice in the online world. Thanks. This is a real brain twist for me, but good to examine the more technical side of WordPress rather than just writing blog posts. I’m sure I’m still doing a dozen things to embarrass myself (can’t even successfully copy and paste the infographic into my own WordPress blog and have it show up, for goodness sakes! ), but I’m changing what I can. Speaking of which (don’t laugh at me), what difference does it make to have the default setting on “Blogroll” since there is not an alternative setting to use? Is this a program–y sort of detail that I’d need advanced training to change? Thanks for keeping us learning! Nita, no worries, we all made lots of mistakes when we started blogging 🙂 It is funny that you mention copy/paste of an image because in WordPress it does not work the same way as in Word perhaps. That’s why it does not work 😉 But there are plenty of videos on YouTube that teach you how to properly insert an image in a WordPress blog post. Regarding blogroll, it comes by default with lots of WP themes. You simply need to take that widget out completely. i found myself guilty on keeping deactivated plugins on my wp directory. I love this info graph. Thanks for the reminder on de-activated plugins! I know I shouldn’t have them there but I tend to forget and then things get cluttered. And as Chris Ramsey pointed out above you should also let go of old themes. I just deleted two that were simply older versions of a newer theme. A huge waste of server space. I’m surprised that leaving your administrator user ID default to “admin” isn’t on or near the top of the list. Now that’s just silly! I think it’s a good list of errors that reminds us to be vigilant. To avoid falling back into the same and find timely, reliable information sources. For example learn from the experts. Thank you for your valuable input. Greetings. That is great 🙂 we all know reading a simple text will not so much helpful as a illustrative text or image with some text. All visual thing directly hit our brain very sharply that’s why we remember images very fast and not the text. A very simple example is advertising ads, sometimes only images make everything. Thanks for sharing this beautiful piece of information with us. I have all my post pages with defaulted /…/indext.php/postname. Is there any difference running site on microsoft windows and linux base. Should setting is according to postname or custom? The wordpress meta widget… a direct link to the admin login page that everyone can see and click on… that’s pretty silly. I totally disagree with you on this one. Having the Meta Widget or any front-end login button is not silly in itself as this is common practice for many sites to allow either clients or site members (depending on what tour sites functionality is) to login easily. Doing this is not silly. If you have not setup sufficient security, then it becomes silly. I have for sure seen some of these errors and my first thought is that they really don’t know what they are doing. And I’m sure when I first started I made some of the same mistakes. Really useful info and a great looking graphic. What’s the best way to deal with slow load times? Hey Jake, one thing to do is to keep the plugins installed on your site to a strict minimum. Check the ones that you have installed and did not activate and delete them if you don’t need them. Awesome infographic and right on with everyone point! Great points about security risks too. Just doing a new install and noticed that file phpinfo.php is visible to the world. Is this a file that can be deleted like readme.html, or does the system use and/or update it? If you need it, how can you block viewers? Wes, I would contact your hosting provider to ensure that it is safe to remove. Thanks for the response. I will contact them about it.